Learn what products are perfectly suited to refresh baseboards, moldings, and soffits—and how to save money on your paint purchase. Q: I’m about to start a painting project and have noticed that paints labeled for use on trim seem to be pricier than other products. Why is that? Are these the best paints for trim, or do I have other options? A: Paint labeled specifically for use on trim and doors (starting at $20 per quart from brands like Glidden) is certainly one suitable option to refresh baseboards, moldings, soffits, and fascia (such as the front of the roof line). Trim paints are formulated with key properties that help them hold up and stand out on those areas, but you can also choose ordinary paint with similar strengths to save money on this project. This guide will clue you in on what to buy to boost the looks and longevity of trim in and around the house. Oil-based paint ($20 to $50 per gallon) has a thicker consistency and longer drying time (as compared with water-based latex or acrylic paint) to ensure that it will fill small scratches, divots, or other minor imperfections in the trim work. Plus, it won’t sag after application and has more time to settle and dry into a uniform layer, free from stroke marks from an angle sash brush (its slanted bristles are ideal for painting trim). Alkyd or natural oil binders also makes these paints naturally more resistant to moisture and everyday wear-and-tear than water-based products—an asset when trim is located in a water-prone or high-traffic area (e.g., baseboards in a bathroom or hallway). RELATED: Solved! Which Comes First: Painting the Wall or Trim? Pick a paint based on placement. 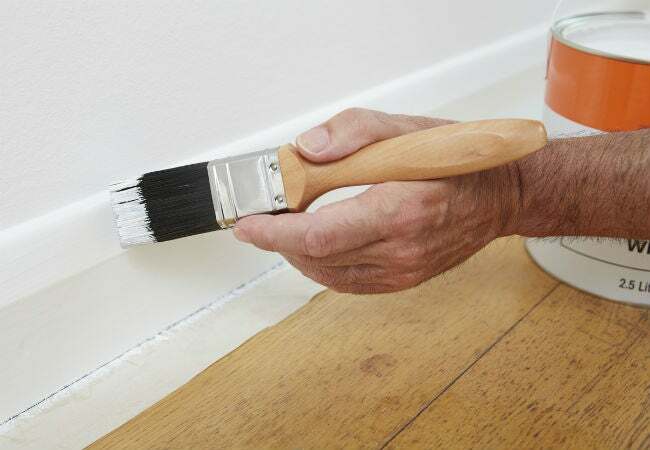 If painting interior baseboards and door casings, the best paint for trim is an oil-based paint labeled “interior” or “interior/exterior.” If painting exterior trim, though, opt for the paint labeled “interior/exterior;” it’s more durable and specially formulated to withstand heat, cold, and rain better than interior paints. An oil-based interior/exterior paint formulated to resist mold and mildew will give exterior trim even better moisture resistance. There’s a reason why trim paints generally aren’t sold in sheens lower than satin: Flat and matte finishes are not only coarser, and thus more difficult to wipe clean, their low reflective properties make them unable to highlight the ornate details in trim. Because trim serves a decorative purpose, the best paint for trim should accentuate the details, so satin, semi-gloss, gloss, and high gloss are all suitable. Semi-gloss, however, is the industry standard for trim, as it offers the best balance of looks and practicality; it’s smoother and more reflective than satin yet masks imperfections more effectively than higher glosses, which draw attention to the slightest goofs. When in doubt, go with white. While neutral colors add an understated elegance and bold shades bring impact, white is the most popular and versatile paint color for trim. It suits everything from modern to rustic design schemes, pairs pleasingly with neutral-colored walls, and gives the eyes a break from brights. 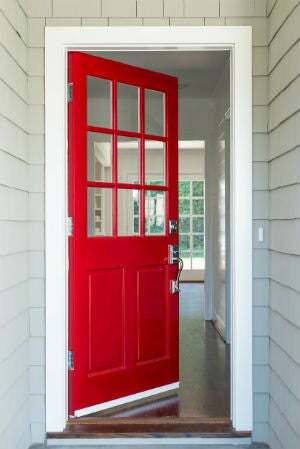 Plus, if you later change the color of the walls or siding, your white trim will still look right at home. Note that there’s a wide spectrum of whites available, from warm creams to cooler off-white to stark alabaster. Just keep in that mind that oil-based paint can yellow with exposure to sunlight and heat; so, if your trim is located near or facing a window, in a room that doesn’t receive much ventilation, or outdoors, look for an oil-based paint that offers some resistance to yellowing (e.g., Manor Hall Interior Alkyd). Pick a color-coordinating oil-based primer. If you’re painting bare trim for the first time, going from a dark to a light color, or the previous coat is flaking, use a dedicated primer (as opposed to a paint-and-primer-in-one product) to help ensure optimal paint adhesion. As with paint, an oil-based interior or interior/exterior primer (e.g., KILZ Original Oil-Based Interior Primer) will afford a more durable, moisture- and wear-resistant coat than a water-based primer. If you’re painting your trim white, take a swatch of the color you chose for the paint with you to the paint store to find a primer that’s a close match to that shade. If you’re painting your trim a color, pick a white primer and have it custom-tinted at the store to match your chosen shade.